« Day 185 in Beijing: YEAH CAKE! Day 186 in Beijing: Cabvertising. I just made up a new word: Cabvertising. I am going to trademark it right now. Cabvertising is now trademarked and can only be used with the express written consent of Aram Nathan Sohigian, Esquire. That is a subtle reference to Bill S. Preston, Esquire for anyone that grew up in the 1980s in America. If you get it, you had a good childhood. What, may you ask, is cabvertising? As I said, it is a word I just made up because it is the only way to explain what I see whenever I ride in a cab in Beijing. 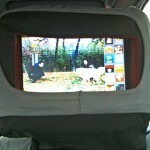 The headrests have little video screens built into them and play advertisements the second the cabbie starts the meter. I have figured out how to adjust the volume, or turn them off, but they seem to reset after a few minutes and go back to their base level. Sometimes it is enjoyable to watch the ads and zone out but usually it is too much noise as the cabbie is listening to his own radio show, possibly talking on his cell phone at the same time, and then these ads are running non-stop when I just want to look at the city and take it in. I’ve yet to see cabvertising in any other country I’ve lived in or visited and it is something specific to China as far as I can tell. 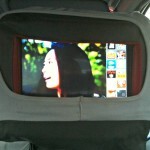 They are touch screens and it seems as if you can watch ads for products that you want and possibly order them right from the cab. I do my best to stay away from touching the screen very much because I don’t want to inadvertently buy something and have to deal with trying to figure that out with the driver. One of the shows playing on my way to work. I have no clue what she is talking about.